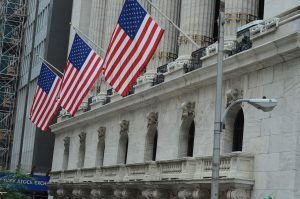 It is typical for financial markets to react when there is a change of guard at the central bank, and the recent appointment of Jerome Powell as chairman of the Federal Reserve was no exception. In his first testimony as head of the apex bank, Powell on Tuesday hinted at a balanced approach to the monetary policy in the near term, allaying fears of aggressive rate hikes. The former investment banker, who is known for his hawkish stance, said the current economic scenario warrants a gradual hike in interest rates. Official portrait of Jerome Powell. He joined the Federal Reserve Board of Governors on May 25, 2012. He cited the strong economic outlook and lesser-than-expected impact of the recent financial volatility on the larger economy as the main reasons behind the moderate stance, but cautioned that inflationary pressures would remain a significant concern. According to Powell, considering the positive employment market, strong consumer spending, and quickening wage growth, he would adopt a stimulative fiscal stance, following the footsteps of Janet Yellen whom he replaced at the central bank. In an optimistic note, Powell vowed to maintain a position that is conducive to continued economic growth. The comments came at a time when the upward momentum in global economies and substantial contributions from the $1.5-trillion tax cut have started adding steam to the ongoing recovery. The bullish economic data that came out in recent weeks had caused fear among a section of investors that the Federal Reserve would overshoot its inflation target. Economic think-tanks had forecasted that the new chairman might go for one more rate hike this year than initially projected. He hinted at further gradual increases in the federal funds rate to achieve the immediate fiscal goals.